All metabolic reactions are catalyzed by proteins (enzymes), including energy releasing and energy capturing reactions. Proteins offer structure to cells and organisms, such as the cytoskeleton. DNA has the stored information needed to determine the sequence of amino acids in proteins. It is essential to understand how proteins are synthesized in order to fully understand how they work. The building of proteins is called protein synthesis. The assembly of proteins occurs outside the nucleus in the ribosomes. Remember DNA is in the nucleus and cant leave – so how does DNA get to the ribosomes? DNA sends instructions for building proteins to the ribosomes in the form of messenger RNA (mRNA). RNA is a nucleic acid. RNA is made up of a chain of nucleotides (phosphate + sugar + nitrogen base). RNA - consists of only a single strand of nucleotide (Remember DNA is two strands). RNA is half a ladder or zipper. The sugar in RNA differs from the DNA sugar. The sugar in RNA is ribose. The bases found in RNA differ as well. DNA is made up of adenine, guanine, thymine and cytosine. Adenine, guanine and cytosine also are found in RNA. But instead of thymine RNA contains the base uracil. In RNA, cytosine bonds to guanine, and adenine bonds to uracil.  Carries genetic information from DNA in the nucleus to the cytosol. Once the mRNA is in the cytoplasm, it moves to a ribosome. This is an excellent animation that goes through the entire process of protein synthesis step by step with very simple explanations of each step. This is an excellent overview of the material that will be covered later on in more detail. Process by which genetic information is copied from DNA to RNA. mRNA moves through nuclear pores into the cytosol where it will direct the synthesis of proteins. The process by which the DNA message is copied into a strand of mRNA is called transcription. This mRNA is then used for the construction of a protein molecule. Transcription takes places in the NUCLEUS because DNA cannot leave. The DNA double helix starts to uncoil. The proceeded mRNA leaves the nucleus and enters the cytoplasm. mRNA carries the instructions that direct the assembly of a specific protein to a designated area on the ribosome. The instructions are carried in a sequence of three nitrogen bases called a codon. This link shows certain definitions on flashcards that can be given to students in order to review the important terminology covered in this unit, or in order to make this more interesting and engaging for students, you can create a modified BINGO game. Create a 4x4 table that takes up approximately an entire page and get the students to write down the terms from a provided list into the boxes. While reading out the definitions, the students have to identify the term and circle it if it appears on their "whiteboard". The rules can be modified, but whoever get's a full line can win a prize of some sort chosen by the teacher. This activity can be appropriate throughout the unit, as a diagnostic or review activity of all terms learned throughout the unit. This can also be modified so all terms regarding transcription are chosen, or all terms regarding translation, etc. This can essentially be done for any topic in any course. In Eukaryotic cells, the mRNA is not ready to leave the nucleus directly following transcription. Modifications need to be made to this primary transcript. A 5' cap is added to the start of the primary transcript. The cap protects the mRNA from digestion by nucleases and phosphatases as it exits the nucleus and enters the cytoplasm and plays a role in the initiation of transcription. The 3' end contains a poly-A-tail. The DNA of eukaryotic gene comprises coding regions (exons) and noncoding regions (introns). If these non coding regions are translated, the protein won't fold properly. Before leaving the nucleus, the introns are removed by proteins called spliceosomes and the remaining exons are joined together. This is a hands on manipulative to teach the process involved with protein synthesis. The kit would need to be purchased (or made by the teacher). Once the message has reached the ribosome, the protein is ready to be assembled. The process of building the protein from the mRNA instructions is called translation. The transfer RNA (tRNA) and the ribosomal RNA (rRNA) are involved in translation. In the cytoplasm, a ribosome attaches to the strand of mRNA like a clothes pin clamped to a close line. tRNA is responsible for carrying the amino acid acids (the building blocks of proteins) to the ribosome so they can be linked in a specific order that makes up a single protein. Each tRNA attaches to only one type of amino acid (correct translation of mRNA depends on the joining of each mRNA codon with the correct tRNA molecule). How does this happen? One end of the tRNA carries a three-base sequence called an anticodon, which matches up with a particular codon on the mRNA. They are complementary to each other. The tRNA carries the first amino acid to the to the mRNA strand. The anticodon forms as base pair with codon mRNA. This places the amino acid in the correct position for forming a peptide bond with the next amino acid (Remember peptide bonds bond amino acids together in proteins). The ribosome slides down the mRNA chain top the next codon and a new tRNA molecule bring another molecule. The amino acids bond, the first tRNA releases its amino acid and detaches from the mRNA. The tRNA molecule is now free to pick up and deliver another molecule of its specific amino acid to a ribosome. Again the ribosome slides down to the next codon; a new tRNA molecule arrives and its amino acid bonds with the previous one. rRNA helps bond the amino acids together to form the final protein. When the STOP codon is reached on the mRNA strand translation ends and amino acid strand is released from the ribosome. Amino acid chains become proteins when they are released from the ribosome. Spongelab is an online learning platform with science simulations, games, and activities integrated into curriculum and provides game-based learning to students. In this game, students must play the role of RNA polymerase, correctly matching complementary base pairs along the DNA strand. 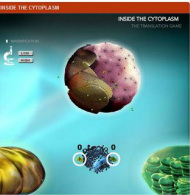 In the Translation game, students must use the available resources and tools (ribosomes, mRNA, tRNA and amino acids) to assemble a functional polypeptide. Once the protein is made it then needs to be sorted to its final destination. 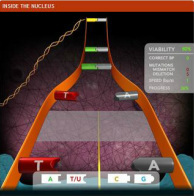 This is an online interactive process whereby students can practice transcribing and translating a segment of DNA in a way that they can visualize the entire process step by step. The activity does not allow for the students to continue until they have the correct answer, so this is an excellent activity to incorporate during the unit in order to visualize the process and further solidify their understanding. In this activity, the students will more fully understand the process of transcription and translation by becoming part of the cell. The students will be cellular spies and will be given a mission to secretly crack a DNA code. This is a very interactive activity, and will get students up and out of their seats in order to complete the assignment which is excellent for both the kinesthetic, visual, and interpersonal learners in the class. This activity is an excellent activity that students really enjoy. This can be done in partners, or individually. Depending on the classroom layout you can print off the codon-word pairings and tape them around the room for students to hunt down, or you can print them off in a table like the genetic code and hand that out to students as well. Or, you can also cut out the codon-word pairings and have the students physically put them in the sentence order. Instead of creating boring protein strands, they end up completing amusing sentences that can then be evaluated. This assignment would be best completed after students have a firm grasp on codon and amino acids and the genetic code. This is a copy of the blackline master worksheets for students to transcribe and translate a gene. To make this more advanced, you could provide the students with a longer and more complicated DNA sequence and tell them to excise a certain number of base pairs (an intron) from the transcript before they continue and translate the mRNA into protein. This website outlines a group assignment that can be completed by students in pairs or in groups of three where they must create a moveable model of protein synthesis depicting all processes involved. This can be done using physical materials and students are encouraged to be extremely creative with their ideas, however, students can also create a video, story, or poem as long as it is done in a creative manner. These models can be presented to the class orally and students must explain the process using their model. I would assign this as a culminating task at the end of the unit as a consolidation of all that was learned.